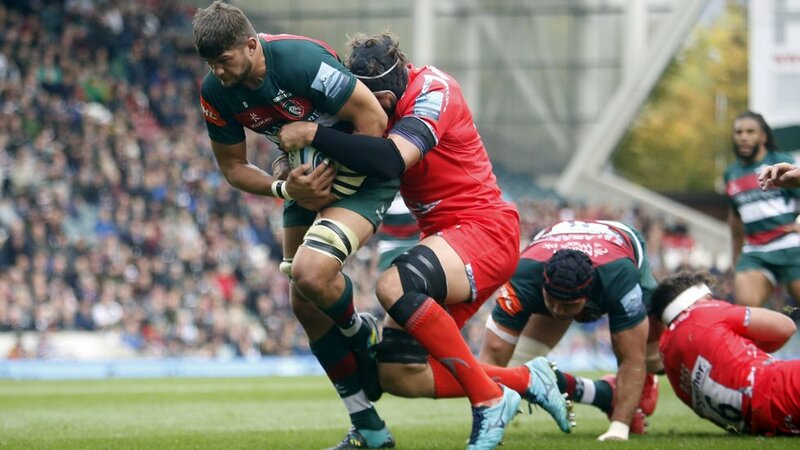 Sale were left to regret missed kicks as Leicester won 19-15 in a sorry affair at Welford Road. Marland Yarde opened the scoring with a simple try in the opening stages, but his five-pointer was cancelled out only minutes later when Kyle Eastmond flew over. Eastmond’s try was as good as it got for Leicester in attack, who relied on the boot of George Ford for their second Premiership win of the season. After defeat to Wasps last week, Steve Diamond rued his side’s inaccuracies in attack, and Sale’s experienced Director of Rugby would’ve been disappointed that the same errors were still plaguing his side’s game. Sale made seven handling errors in the first half, and were lacking the direction that the injured AJ MacGinty usually provides from fly-half. Sam James – deputising at outside-half in MacGinty’s absence – wasn’t able to gain any control on the game, in stark contrast to George Ford’s metronomic accuracy in creating opportunities for his backs. Leicester’s defence had been porous in the opening four rounds, conceding an average of 39.5 points per game, but Sale’s ineffective attack barely looked like threatening them all game. Whenever the Sharks ventured into Leicester’s 22, they were lateral, futile and painfully slow, and the spotlight on Tigers’ defence grew darker and darker. Dorian West was announced as Sale’s new Forwards coach in the week, and on this evidence it looks as if the former Northampton Saint has a lot of work to do. Sale only successfully completed 72% of their line-outs, while the forward pack looked worryingly inefficacious in open play. Though their inaccuracy was disappointing, Sale’s forwards were a difficult proposition from the driving maul, scoring two of their three tries through this tactic. In truth, this affair was difficult to watch; it was littered by errors from both teams, who both looked short of quality throughout. For a Leicester side who last season were competing for a top-four place, today’s performance shows Tigers’ marked switch from title contenders to Premiership strugglers. Despite Jono Ross’ insistence in the week that it’s too early to think about relegation, the nightmare surely must be taken seriously as Sale now lie bottom of the table after five games, with Worcester and Bristol both showing lots of promise in the opening rounds.